Caserta boasts a very particular history, which developed in diverse periods and covers two centres. The Casamirta of Longobard origins was founded on the Roman ruins of Saticola during the 9th Century, in the Duchy of Benevento and established as a county by Ruggero II for Roberto di Lauro in the 12th Centure. In 1268 Carlo I d’Angiò confiscated it from the descendants of Roberto; it then became the centre of a revolt of the Ratta, the Acquaviva and the Caetani of Sermoneta, finally passing hands to the Bourbons, through the intervention of Queen Maria Amalia in the 18th Century. Caserta Nuova was established around 7km from the old City, when the Reggia (Royal Palace) was built: from that time it continued to gain great importance. Constructed in the second half of the 18th Century at 7km from old Caserta, the new City developed around the great Bourbonic Royal Palace, with ample roads and rectilinear right angled crossroads. In the district of Caserta Vecchia (Old) (401 m above sea level), a picturesque, medieval neighbourhood, with Longobard origins, there is a beautiful, preserved Cathedral, of Pugliese and Arabic-Siculi elements (12th Century) and a small Gothic Church of the Announciation (end of the 13th Century). 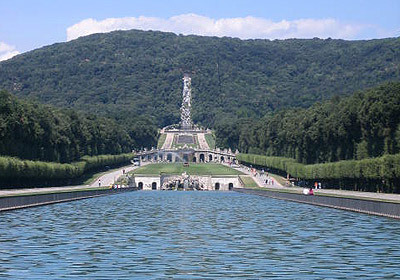 The Royal Palace of Caserta is the most grandiose Italian Palace, constructed for Carlo VII of Bourbon, King of Naples. The original project by Luigi Vanvitelli (1750-1751, son of the Dutch view artist, Gaspard Van Wittel, who moved to Italy in 1675) provided not only for a Royal Palace and its park, but also the plans for the new City.